The Global Sports Markets FREE SPORTS PICKS are based on derivatives from the Vegas rotation schedule as well as some of the most popular sports markets around the world. 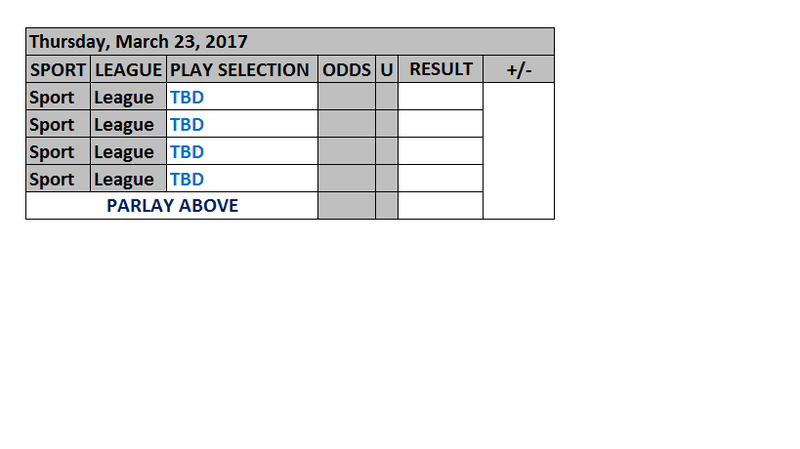 We usually do 3-5 plays per day where each play assumes 2 units risked (maximum juice: -150 / 1.67); parlays are 1 unit while PODS are for 3 units. Whether you agree or disagree with our selections, please remember to always follow basic bankroll / risk management principles as there is no such thing as a guaranteed winner; risk whatever you're willing to lose without losing any sleep. If you are new to sports betting, don't have a bankroll, and/or have very low tolerance levels, please DO NOT tail our plays; instead we encourage you to join our free Bankroll Builder (scroll down). NEW TO SPORTS BETTING? NO BANKROLL? LOW TOLERANCE LEVELS?